January 2019, Mt. 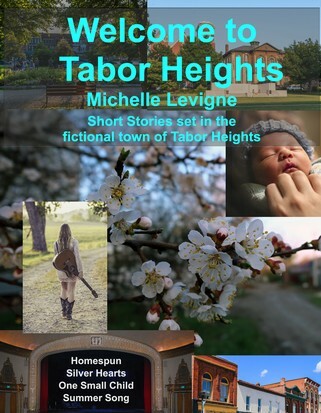 Zion Ridge Press started re-releasing all the Tabor Heights and Quarry Hall books in ebook. You can obtain them from the Mt. Zion Ridge Press website -- https://www.mtzionridgepress.com -- as well as at the usual online retailers, Barnes & Noble, Amazon, Kobo, iBooks, and others..
Maybe you want to "taste test" the feel of the town and the people you'll meet in the books with this collection of short stories. You have the option to subscribe to either series at Mt. Zion Ridge Press, and have the books delivered automatically in your email, before everyone else can get them in the store -- and at a nice little savings. Check out Mt. Zion Ridge Press for details. WHAT is Tabor Heights, you ask? A friendly little town on Ohio's North Coast, where sweet romance is always in the air. Here you'll be able to explore the lives of the members of the congregation of Tabor Christian Church in the space of two years. The stories overlap, and there's no one right place to start. It's the same way with Tabor Heights. Start with the story that interests you the most, and then branch out.